By the time we got down to Oaxaca, Mexico we had gained enough experience to know that we needed a few things tweaked before we hit the next border. We stopped at Overlander Oasis because we had heard of Calvin's mad fabricating skills and Leanne's wealth of knowledge and amazing hospitality. 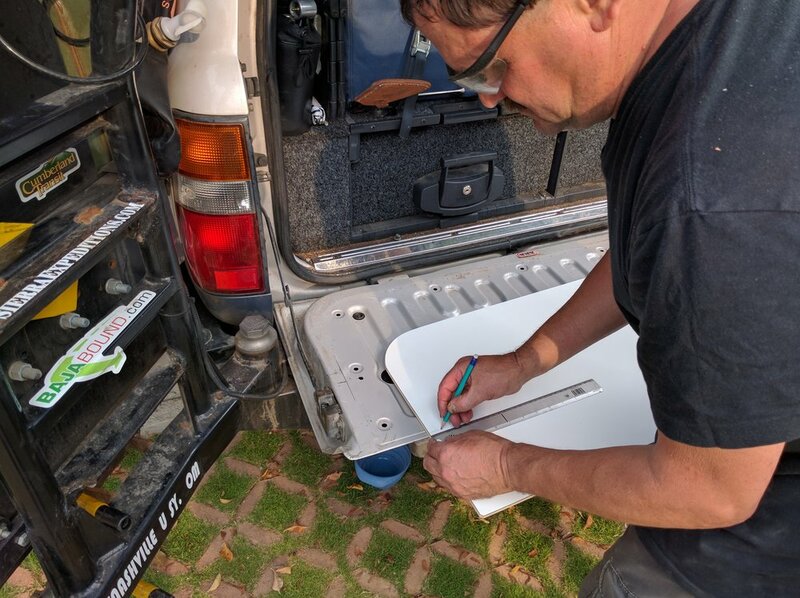 We doubled our "kitchen space" by removing the original carpet on the tailgate of our landcruiser and replacing it with a custom countertop. Here are a few pictures of the process. Before we got there, Calvin helped a couple of overlanders, John and Mandi of johnandmandi.com, build a countertop for their awesome kitchen in their van. They had some counter material left over from the project and they were nice enough to leave it at Overlander Oasis for the next poor soul that needed it. That happened to be us. Calvin spent a lot of time planning and taking exact measurements before he began the modification process. We purchased another, thinner piece of countertop material so we would have the same surface on both sections of our new counter. We took off the carpet backing and Calvin used it as a template to cut that piece for an exact fit. The counter has a swivel design that allows the top piece to tuck neatly in place when not in use. The carriage bolt that it rotates against had to be perfectly placed in order for it to rotate smoothly. The backing was routed out perfectly to fit in the stock location of the carpet. This is the attention to detail that we love about Calvin's work. He made this little bracket to keep the top piece from slipping into the crack of the tailgate opening when we close the gate. He also fabricated a bracket, complete with a rubber foot, at a perfect angle to distribute the weight properly across the counter when it is open. Inspecting his work. Gracie gave her nod of approval. We love this thing. It has allowed us to use the left side for our stove, which attaches to the propane tank right behind it, and the main part for chopping, etc. Before we had this, we used to have to move everything out of the way every time we needed to open a drawer. Now it's easy, breezy, cover girl.